October has been a month for conventions for me and my friend and fellow comics-creator Kay — two in one month, which is a lot for me. Showing my work at conventions, as with fairs, festivals, and art shows, is pretty intense labour — beforehand, during and afterwards. 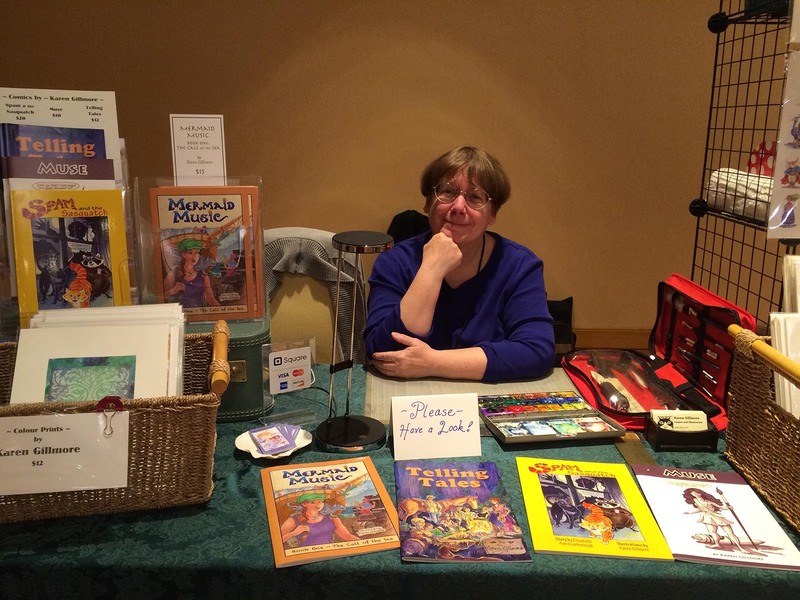 Kay has been gracious enough to come along on the trips and help me out, learning the ropes of having a convention table in the process — she’ll be launching her own webcomic soon, so next time she may have her own table. As for me — I’m glad to be done for the autumn and back to more sedate pursuits, like making comics, teaching, and blogging! Our first trip was to Richmond, BC, a suburb of Vancouver. We were bound for VCON, a science fiction and fantasy convention that has been running for 40 years. It was wonderful to be back at a SF/F convention — the last one I did was the World Fantasy Convention in 1999 in Providence Rhode Island! SF/F conventions are a little different from comics conventions, but there are a lot of similarities too. They both have Dealers’ (or Vendors’) Rooms, usually with a separate Artists’ Alley area for people who are actually making things. This often includes jewelry, stuffed toys, steampunk or medieval costumes and gear, artwork, games, and of course, comics! Both kinds of conventions have interesting panels and talks by artists, writers, and others; people walking around in costumes; and above all, fans! Any trip off the Island usually starts with a ferry ride. One can fly, of course, but for trips to the nearby mainland, I always really enjoy the trip across the Strait and the sights to be seen. Kind of grounding, it is, although that’s a funny thing to say about a trip on the water! 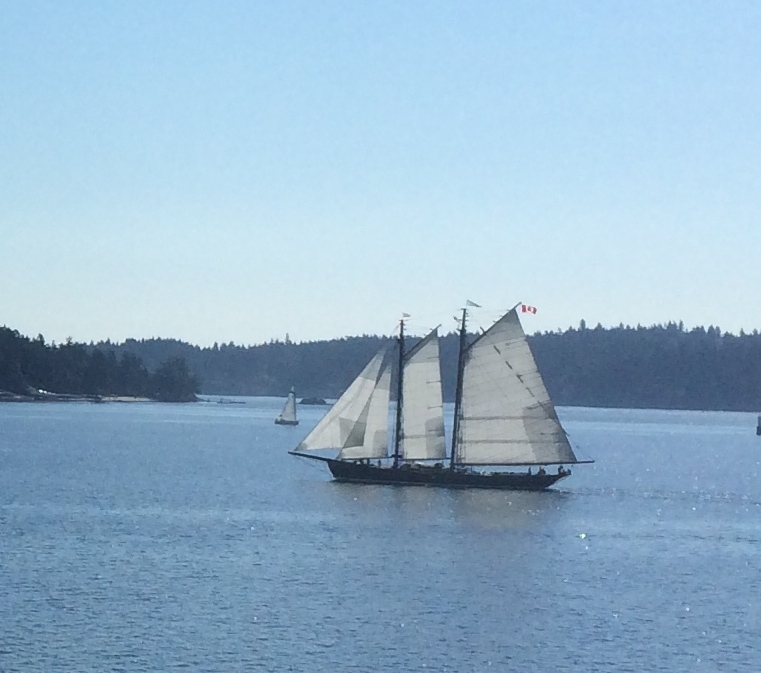 I didn’t have my “good” camera with me onboard the ferry, and had to take this with my iPhone through the somewhat spotted window, then crop like mad! Once on the Mainland, we found the Sheraton Airport Hotel easily (although I really hate driving in the Vancouver area, having a navigator with a phone app is a huge help!). The neighbourhood is very Asian, with many signs in both English and Chinese characters, and the wide, tree-lined avenues are very attractive. Upon entering the hotel, we found ourselves surrounded by folks who were obviously not the usual posh-hotel denizens — people in bits of costume or t-shirts proclaiming their particular fan leanings, carrying stacks of books and portfolios full of art. We were still early for set-up, so I leant a hand with the art show — not much of one, because they already had lots of volunteers. The art show panels are 4×4 foot panels of pegboard mounted on frames of 2x2s, and held together in various configurations by large eye hooks screwed into the sides at different heights, by which multiple panels can by joined using long dowels as hinges — it was really interesting seeing a complex set-up take shape following a map held by the director, from a stack of unhinged panels against the wall, into a labyrinth of little “rooms” and “walls” to hang our art upon. It was all done in less then two hours, an impressive feat indeed! 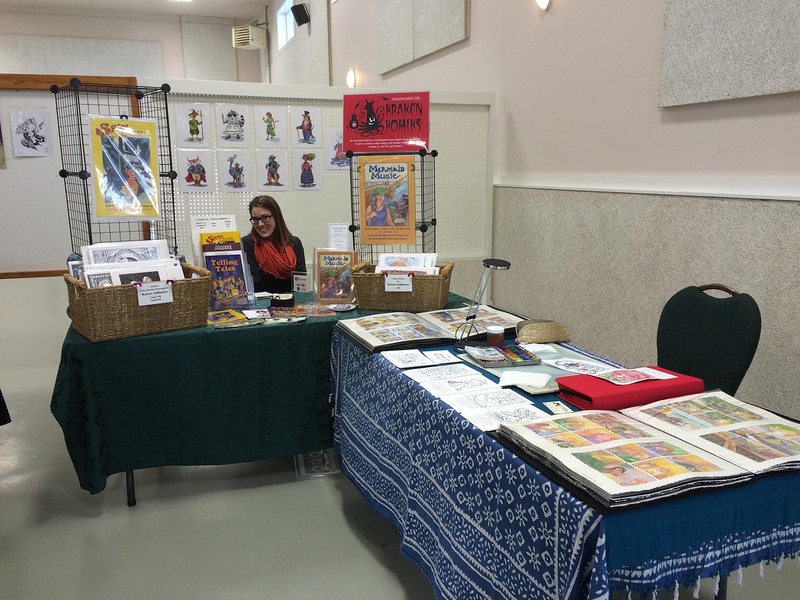 When I realized that I wasn’t needed at the art show setup, Kay and I went over to Artist’s Alley and set up the table. I had bought a set of modular wire shelves at Canadian Tire, which a lot of people use to give height to their tables, and was really glad that I did — I put prints of the Time Traveller series on it and it was visible from a long ways away. Satisfied with the results, we went back to the art show to see if the panels were ready to hang. My trusty assistant, Kay, with the Tower of Prints we set up. We were back in the far, far corner of the hall, so needed the height to bring people back to look. The panels were up, and all I had to do was use the pegboard hooks provided to hang my art. I had printed off and filled out the bid tags already, and made little cards to explain a bit about each painting, since I wouldn’t be there to talk to people. I’m not sure that was the best idea, since I didn’t have room to put them on the panel and had to stick them on the frames themselves which didn’t look as aesthetically pleasing as I would have liked. A variety of book cover and comic art made up my art show panel — the paper bits hanging all over the place are bid tags, as the pieces are sold at auction, with a minimum bid determined by the artist. A lot of work went into the framing (did I say I hate framing? I do. ), which I do myself, and of course I left it until the last day before, and had all kinds of glitches to contend with. …and bleary-eyed the next morning, we grabbed caffeine at the in-house Starbucks and slithered off to Artist’s Alley. We took turns throughout the convention swapping off watching the table with going to panels — they had some great subjects; some of the ones I attended were “The Evolutionary Tree of Dragons” (which inspired Wendell the Wyvern), “Time Travel Impracticum”, and “Writing in the Ways of the Past”. The obligatory pose-with-the-art. I was so tired! But happy to be there. In Artist’s Alley you’re supposed to be demonstrating your work, so I had a little set-up with my drawing and watercolour tools; I did some of the Inktober drawings that I posted about earlier there. It was a really fun weekend, and we met lots of great people. I didn’t actually sell a lot (sales were down all over, I found out from talking to my fellow vendors). 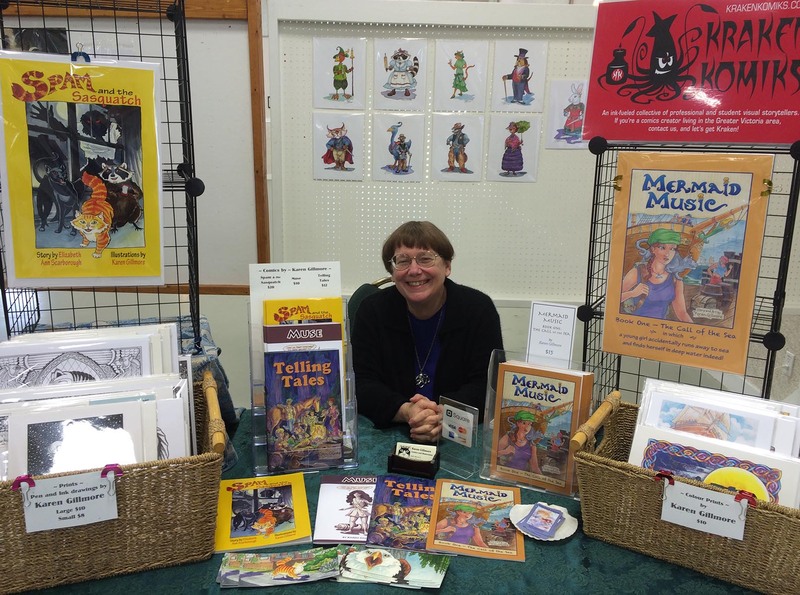 I sold more prints than comics, which is a little discouraging —people seem to assume that my books are mainly for children, possibly because of the bright colours. However, I learned a lot and got a lot of inspiration, and I’d do it again because it was so enjoyable. Part of the work of any convention is afterwards: the unpacking and stowing of all the stuff you brought. Knowing that I was going to head off again soon to another show, I repacked all my prints, comics, and infrastructure right away for the next one, and left it in the least obtrusive place I could find for the next couple of weeks. I’m sure if I did this all the time, I’d have a permanent spot for it, and this bears thinking about! Yesterday Kay and I made a trip to Duncan, which is the next (small) city north of Victoria on the Island Highway, which runs up the east coast of Vancouver Island, about an hour’s drive. Our goal: the Duncan Comic Book Expo! The event is in its second year, and I had only heard about it just before VCON, so I really had no idea what to expect. It’s organized by the Duncan Comics Club, a group of fans and artists. I hadn’t heard of them before, and was eager to connect with some of our up-island colleagues. 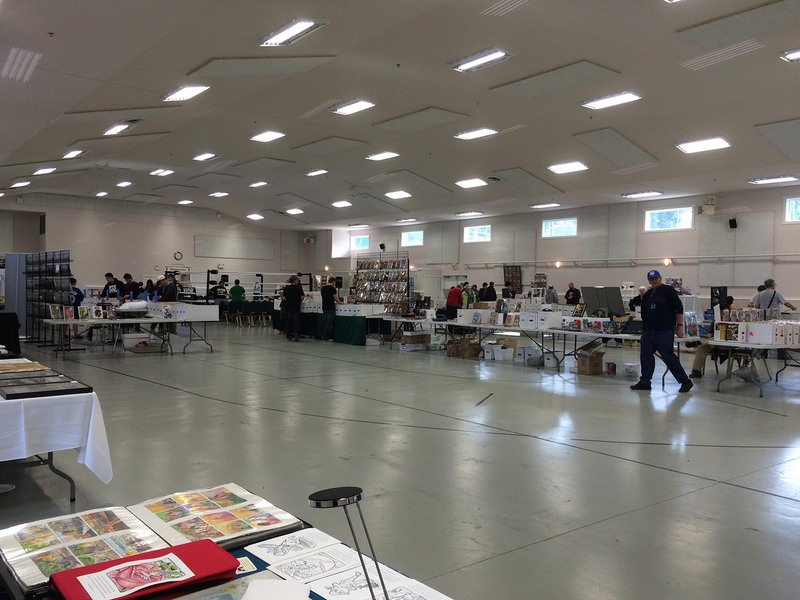 We pulled up to the venue, the Cowichan Exhibition centre, a large, bright, airy hall. Katrina, the organizer, was capably directing table set-up, and immediately directed me to my tables (in the corner again — is this a pattern?). There was a conveniently located door where I could pull up the car and unload right to my table — after VCON, and the long distances we had to haul things, I had brought my heavy-duty trolley, and didn’t even need to take it out of the car! 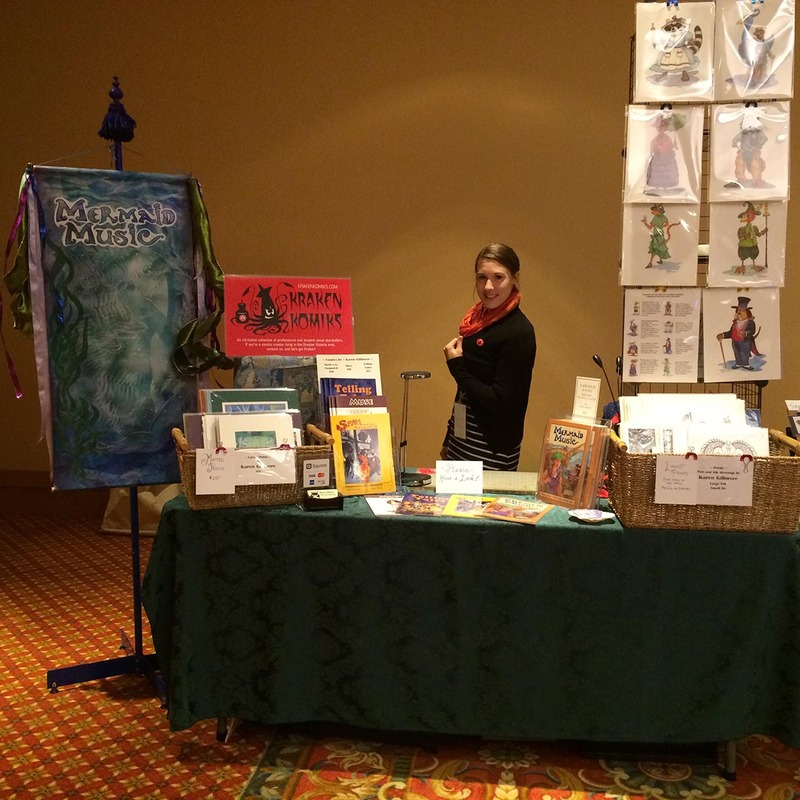 I had also planned for a stripped-down setup, having learned what I needed and didn’t need from VCON. The hall was not quite as huge as it looks in this IPhone photo, but almost! Our setup was a smooth as if we’d been doing it together for years — Kay is one smart cookie! The corner configuration gave us the opportunity to try a different set-up. I liked it, but it definitely takes two people to run it this way. We used the towers a bit differently this time; instead of making one towering, uh, tower, we made two, incorporating one of the crates that held the comic display racks as well. 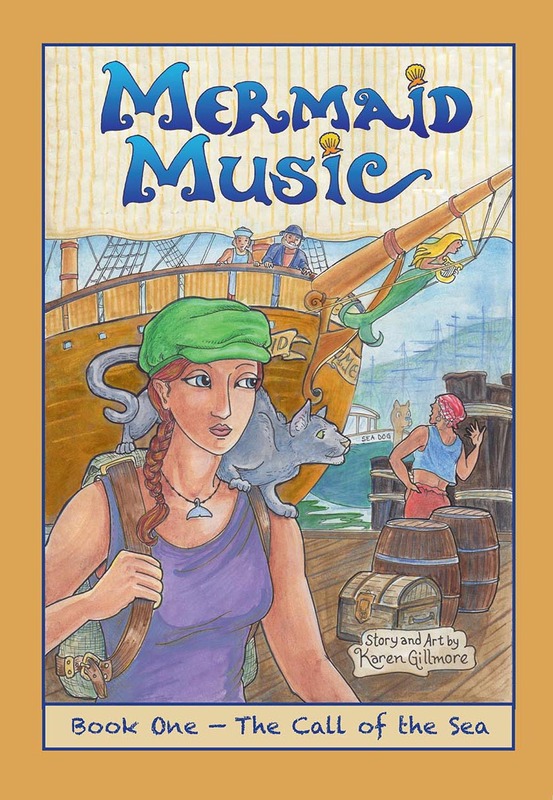 I had made a big poster for Mermaid Music (we didn’t bring the banner this time) and already had one for Spam, so put those up instead of prints. The obligatory photo of me behind the comics! … and guess what? We sold all comics this time, no prints! Those towers are spooky. 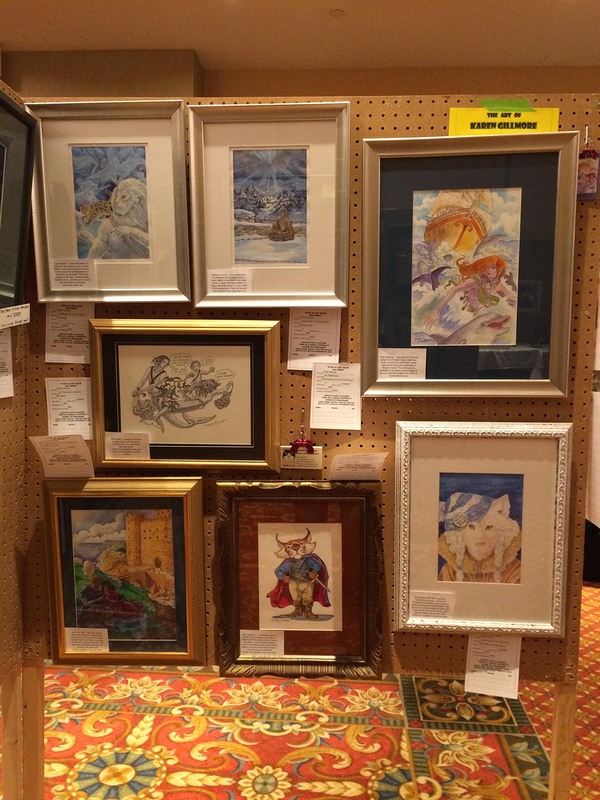 As is usual in Artist’s Alley, artists were asked to demonstrate their work. 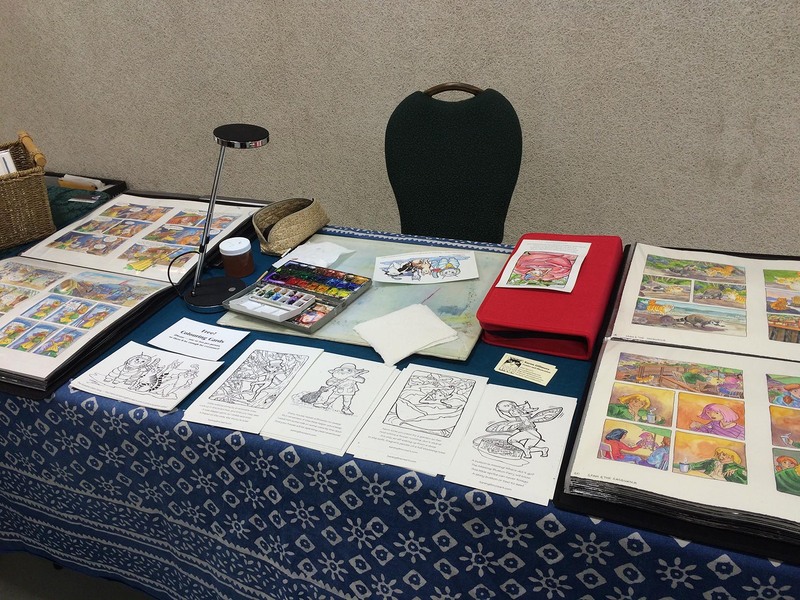 I had a lot more elbow room to work here, and was able to set up my portfolios of originals on each side. I had also made some colouring cards of some of the Inktober drawings, and ended up painting two of them for the organizer as part of my demo. It was really fun to talk to people about the original comic art, and see them flip through the portfolios. Many people don’t realize how much work goes into making a comic, especially one that is hand-painted; it’s a great opportunity to do some educating! I painted these colouring cards with watercolour. It was not watercolour paper, but regular cardstock, and was a little bit strange to work on, as it was not designed for wet media. But ultimately it worked fine, once I had figured out that I had to work really, really fast! The kids (of which there weren’t as many as I expected), and some of the grownups too, were happy to get the colouring cards, which I was giving away. 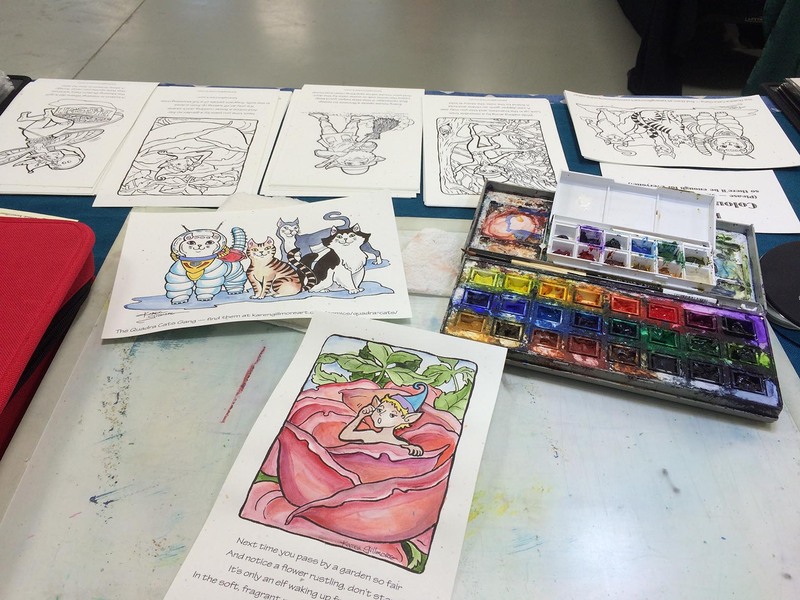 They have a link on the bottom to this blog, so if you found me through the colouring cards, welcome! 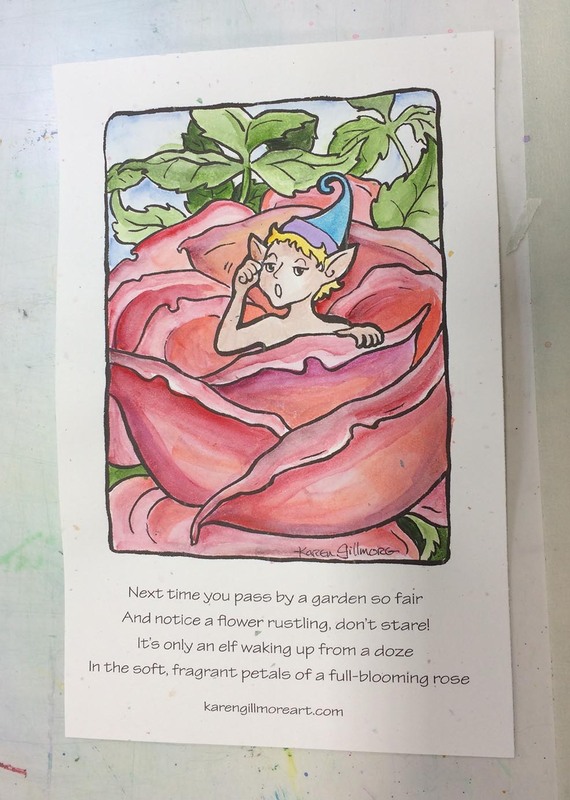 This is the little Rose Elf I posted a couple of days ago. I have made some funny little rhymes to go with each elf, sort of like you’d see in an antique children’s book. 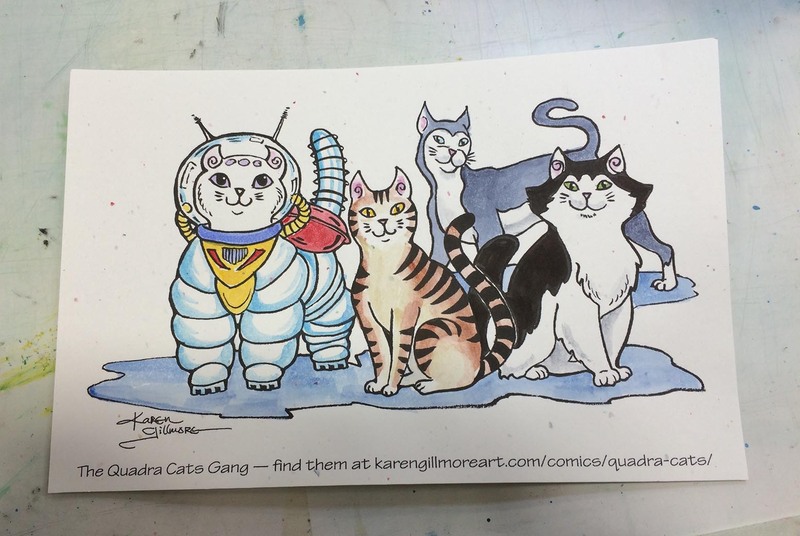 I also coloured one of the Quadra Cats colouring cards for Katrina, and got my first look at what they would look like in colour! I’d been planning to do the original for the demo, which I did later, but this gave me a chance to make sure I’d like the colours first. 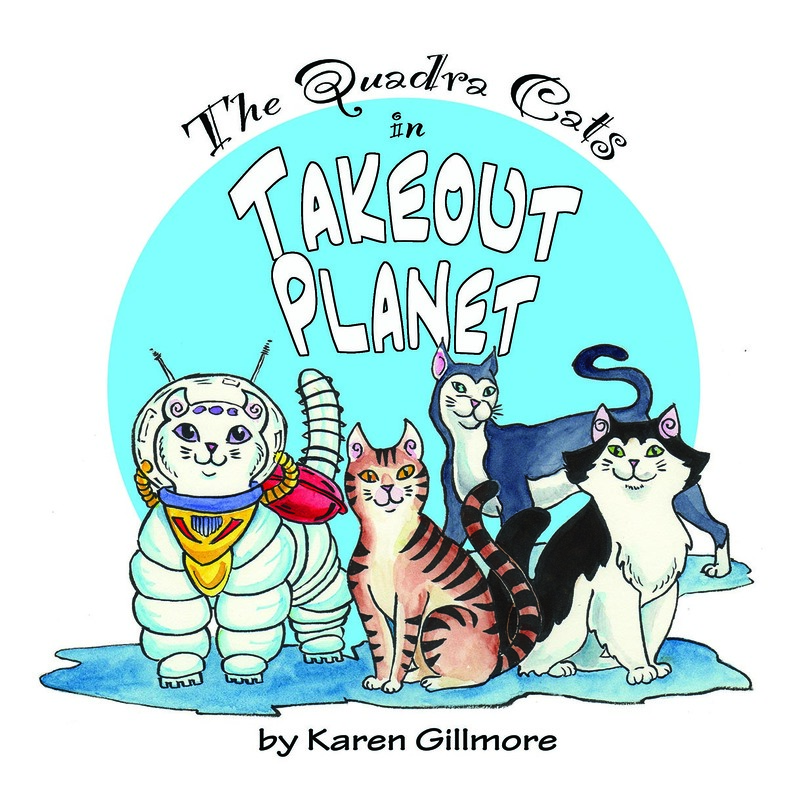 Still a few finishing touches to the original to do, and then Photoshopping it to the right size, then I’ll put it up on the Quadra Cats page. The expo was enjoyable, overall, though I was very tired from having a music gig the night before (double-wired from playing and anticipating an early alarm doesn’t help my sleep!). We met some really nice folks (including our table neighbour, Nevin Arnold — I’m now a Calavera fan! ), and I found some great discounted graphic novels and comics series bundles in the bins of one of the dealers. They could have packed a lot more people into the hall, and I hope that the event continues to grow to fill it — I’ll be happy to go back next year. The day was mostly very relaxing — although there was a wrestling ring set up for a separate evening event, and there were wrestlers practicing in the afternoon, which was very loud, and as soon as the show ended the wrestlers started checking out their sound system at headache-inducing volume. I should have taken some food along, as all there was to eat was from the concession stand, which had the usual concession-stand kind of food; not something I usually forget, but this was certainly re-inforcement. Always something to learn for next time! Kay and I packed up in record time, spurred on by the wrestlers’ soundscape, and stopped in downtown Duncan for some much needed Real Food and tea at the Island Bagel Company, one of my favourite places to eat in Duncan. Then back homeward, having packed a lot into one comics-filled day! Hi Leo! That would be great — you would love it, I’m sure. What an exciting time at the comic expos. Your body of work is incredible. I love your drawing style. Good news on the sales. Thanks, Sharon! I’m looking forward to a bit of quiet time now, for sure, to keep plugging away at that body of work, heehee! Great to hear about what you’re up to! Hope some of the comix that sold were Spammy! Indeed they were! About equal all around, actually, which is encouraging. So much work to set up and take down, the never ending cycle of artists displays. Good for you, Karen, you keep at it and work so hard. Your images are wonderful and I know people really love them! Thanks, Marcia! Yes, we all know that cycle, don’t we? It would be interesting to have a discussion with a bunch of different artists and crafters as to how they handle the before-and-after of a show. Hm… idea for a blog post!